On the morning of October 13, Prof. Sakkie Pretorius, Vice Chancellor of Macquarie University in Australia, David Harrison, Minister of International Affairs, and Renyi, head of the graduate department, visited the Institutes of Science and Development,Chineses Academy of Sciences (CASISD). Pan Jiaofeng,president of CASISD, Zhang Feng, vice president, received visiting representatives and held seminars. In August of this year, when President Pan Jiaofeng and his colleagues visited Macquarie University, both parties reached a willingness to cooperate on jointly training doctoral students, conducting scientific and technological strategies and policy research, and especially afterwards, they discussed in depth the work departments of the two sides on the content of the memorandum of cooperation , Reach agreement. Taking advantage of Vice President Sakkie Pretorius's visit, the two sides signed a memorandum of cooperation. At the signing ceremony, Pan Jiaofeng briefly introduced the development of the strategic consulting institute and the background of cooperation with McCarry. Professor Sakkie Pretorius introduced the purpose of this trip and expressed his desire for further cooperation between the two parties. 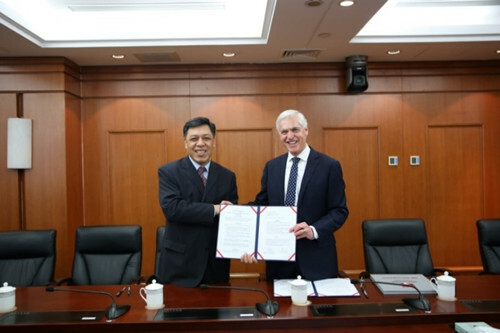 According to the memorandum of cooperation, the Strategic Consulting Institute will carry out in-depth cooperation with Macquarie University in the fields of social science and humanities such as science and technology policy, innovation policy, management science and engineering, and sustainable development. The forms of cooperation include personnel training, joint scientific research and common development Organize major scientific and technological activities. After the signing ceremony, Zhang Feng presided over the academic discussion and joint training program preaching links. Prof. Sakkie Pretorius delivered a lecture entitled "The Influence of Synthetic Biology on the Future Society" with the "Synthetic Yeast" project jointly carried out by China, Australia, the United States, the United Kingdom and Singapore as its background and explained profoundly and profoundly the course of synthetic biology and the status quo And the future, and looks forward to the benefits and risks that synthetic biology may bring to the future society. Lecture won the presence of researchers and graduate students warm applause. Participants conducted an active and in-depth discussion on the lecture for nearly an hour. In the joint training program preaching link, Mr. Ren Yi, head of postgraduate department of McKee University, introduced the position, mechanism and process of doctoral co-cultivation plan of McKelley University in detail. The focus is on the doctoral students Joint training agreement made a preaching. The two sides also reached an agreement on joint training of postdoctoral fellows and reached an agreement on the mechanism for short-term exchange of visits by researchers and managers. The talk aroused heated discussions among current graduate students and mentors. Located on the northwestern Sydney CBD, McKay University covers an area of 135 hectares and is located in Australia's premier, largest high tech center in Australia with a large multinational corporate office next to it. University, including business schools, humanities and social sciences, science and technology college three departments. Major disciplines include economics and finance, management, pedagogy, linguistics and psychology, humanities, law, sociology, cultural media, laser research, environment and life sciences, information and computer science, etc., which have enjoyed a good reputation in the world. More than 40 people, including Rui Wei, head of APAC Region, Ning Pen, business director, foreign cooperation and exchange office, information network and communication center, management institute and strategic researchers and graduate students attended the conference.